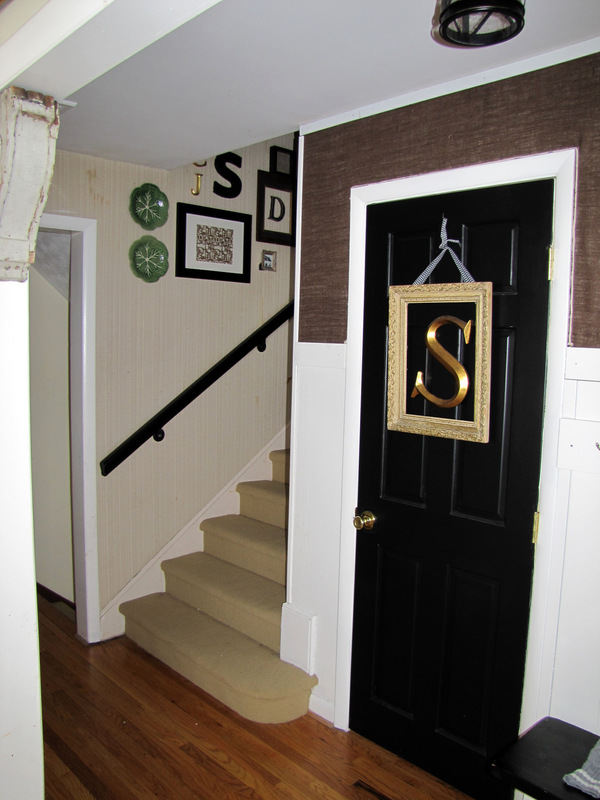 Recently The Nester did a post on using your camera as a decorating tool. Sometimes, it’s not until you see something in a photograph to help you notice what’s wrong. Weather it’s an outfit or a room, the camera can be a great tool when it comes to tweeking things. I hung some photos in our stairway recently. I wanted to divert your attention away from the horrible wallpaper. So , I thought I could cover it up with a series of black frames. and, boy, are you all a nice group of friends. You gave me such great comments. I guess it’s all relative, what was there “before” was a mess. So anythings better right? I guess. But after looking at the photo, I honestly wasn’t in love with my work. still hate the walls, but better. ’cause the room ‘s not looking as yellow as it did in the first post. So, besides the camera being your friend, I found out that you guys are too. You told me how great it looked, even though it really wasn’t all that hot. ‘Cause , sometimes it’s better to just be nice. Love the cabbage leaf plates. I absolutely love your blog! 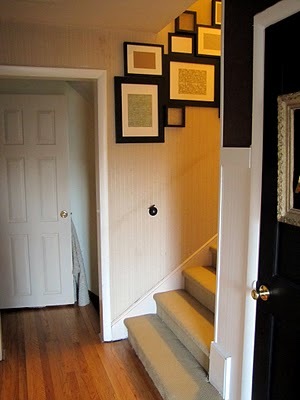 Looking at the pics of your stairway…..the one thing that would drive me crazy everytime I walked by…..would be that little frame where you can see the little stand on the back! Am I just compulsive? Or, now that I've pointed it out, will it drive you crazy too? 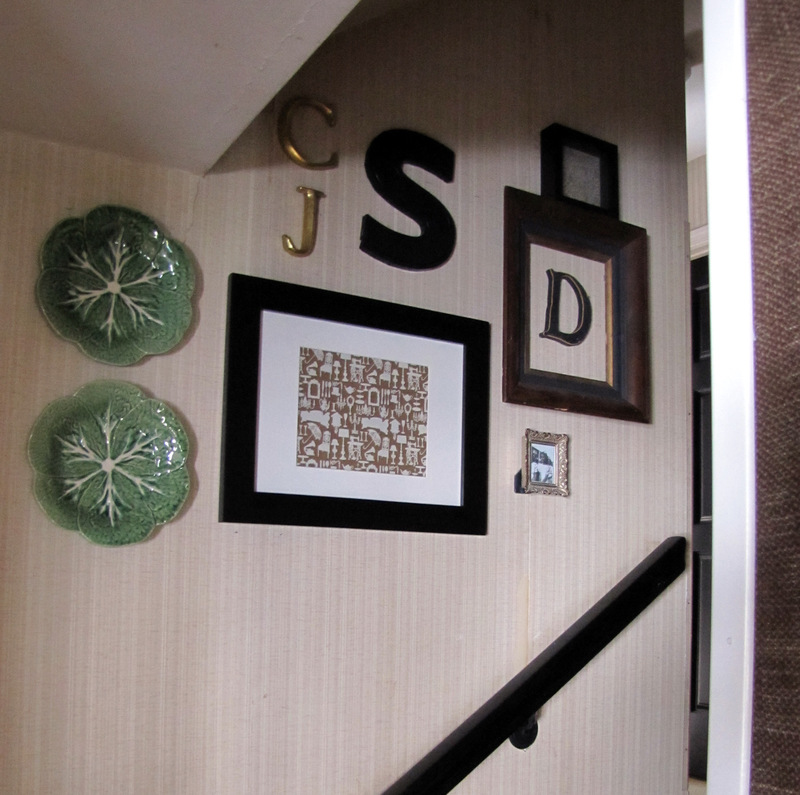 Either way, your stairway looks great and it's always fun to check in! It really does look good. Honestly, I didn't even notice there was wallpaper on the stairwell wall until you pointed it out today. You know, I like the before and the after. But the letters are pretty cool. 🙂 I didn't notice that you had wallpaper, either. It looks like a painted wall. I like both. With just the frames it is very nice design – I'd say heavier though than the 2nd with the letters and plates. I wonder if you painted a few frames, it might not have the heavier look?